Just thought that in the manner of all self-obsessed bloggers, I would allow to enjoy a photo of my breakfast this morning. Like all Indians living abroad, the festival never fails to open up childhood memories – of new clothes; of waking up early in the morning and having baths with utana – a kind of perfumed scrub – and oil; of dear old Vimal shouting “Heppy Diwali” at 5.30 am to wake us up; of my dad haranguing our family priest to shorten the annual puja; of loads of food that was made days in advance but only released to us on Diwali morning; and loads and loads of mithai gifting. Yes, mithais – the supremely sweet Indian sweets made of milk, ghee, nuts and god knows what else. Of course, we try and recreate some of these memories for our son – so in between swimming training sessions over yesterday and today we’ve had our baths with oil (Jo Malone obv) and paste; we’ve lit numerous lamps around the house; we’ve presented friends with small lamps and big mithai boxes; we’ve graciously accepted small lamps and big mithai boxes; we’ve watched bonfire night fireworks in Blackheath and pretended they were laid on for us by Lewisham in honour of Diwali – and more importantly we are continuing to gorge ourselves into oblivion till Tuesday when Diwali ends! 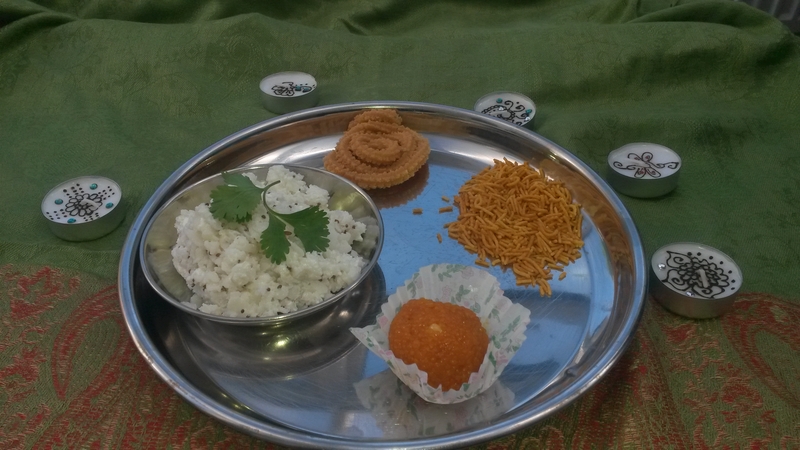 This entry was posted in Biryani and tagged chakli, Diwali, diwali food, diwali greetings by Poornima. Bookmark the permalink. @Biryaniquest lovely post. We are the same with our girls. Happy Diwali!